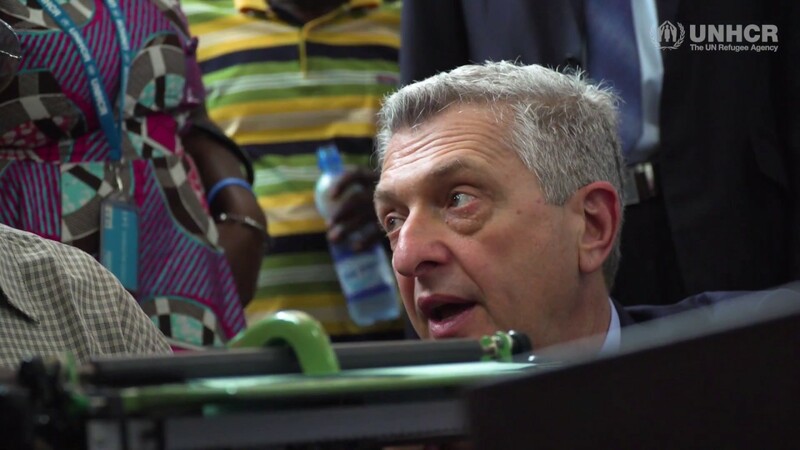 UN High Commissioner for Refugees Filippo Grandi praises generosity of Congo, urges more international support for concrete solutions. MULONGWE, Democratic Republic of the Congo – Praising the generosity of the Congolese people for hosting refugees and sharing often meagre resources, UNHCR chief Filippo Grandi has called on the Democratic Republic of the Congo and its neighbours to step up efforts to find “principled, just and concrete” solutions to the complex crises of the region. Grandi also urged the international community not to forget the inter-connected plight of millions of refugees and internally displaced people simply because they are a long way from Europe. “I must say I am very impressed… this is not a rich area, it is a poor area and yet refugees share many resources together with the local community,” he said during a visit to this site for Burundian refugees in the troubled province of South Kivu in eastern DRC. Funding shortages cause cuts in food rations. “There are 35,000 Burundian refugees in this area around us … they have been given land and the children go to local schools and the refugee population can go to the health centres that are provided for the local population,” he added. Ending a four-day visit to the country, Grandi met refugees in this refugee site at Mulongwe. Several told him there was insufficent food aid after funding shortages forced the UN World Food Programme to reduce weekly rations. A 32-year-old mother of six told the High Commissioner she now felt much safer than when she was in Burundi. However, she said there was not enough to eat and little other help, like clothes and lighting for their mud-walled temporary shelters. “My children have to go to school barefoot, we have nothing – we left everything behind when we fled. after my husband was killed,” she said. Grandi, who flew to Eastern Congo on Saturday (April 7) after meeting senior government officials, including President Joseph Kabila, and visiting urban refugees in the capital Kinshasa, said his visit served as a reminder that countries like DRC, which hosts a total of some 540,000 refugees, needed support. “In many of the places where the refugees are, the impact is very substantive on the meagre resources of the local community,” he declared. However, noting that the Great Lakes region had suffered from inter-linked crises for more than a quarter of a century, he said that a renewed emphasis on finding solutions needed to be undertaken. “Solutions exist but they are yet to come and meanwhile people are still suffering – Burundian refugees, the local population and we need to keep these people strong. We need to help the local authorities and the national authorities of Congo to bear the brunt of this hospitality,” Grandi said, adding that recent insecurity in this area had also led to large numbers of internally displaced people who also needed support. “There is an urgent need to find principled, just, concrete and durable solutions … Many of these refugees will not trek for thousands of miles, cross the sea to remind the world of their existence... They stay here, they suffer here, but they are equally in need and they deserve our attention -- our political attention to find solutions, and our humanitarian attention to bring relief to their plight," he said. The High Commissioner also met a group of displaced Congolese, all of whom had fled their homes in Nyanzale in North Kivu province at the end of 2017, when armed groups attacked the civilian population. Grandi said internal displacement again highlighted the need to establish security in the affected areas and then provide longer-term assistance to encourage development to complement humanitarian initiatives.